Terrormisu (also known by her false name Tiaramisu) is an ancient demon who surpasses Count Cannoli as the main antagonist of Wario: Master of Disguise and is also the game's final boss. Her name is derived from "tiramisu", an Italian dessert. Long ago, a powerful and rich pharaoh by the name of Poobah desired to have one wish granted, despite his immense wealth. To do so he summoned a demon by the name of Terrormisu from another dimension, who agreed to grant his wish. However, she would do this only if he made his people starve. He agreed, intent on his wish coming to fruition, and his kingdom collapsed. He expected his wish to be granted, but instead she had tricked him, stolen his riches, and left his kingdom in ruin. But then, a powerful wizard by the name of Cannoli the First appeared and used his powers to seal Terrormisu within the Wishstone, scattering the stone's pieces far across the globe to make sure that Terrormisu would never be able to return. She first appears in episode 7, "Fouling Up the Whole Works", warning Wario not to venture into the volcano. Later, in episode 8, "When Dolphins Ruled the Earth" she helps Wario advance through the boss fight. After this, she disappears, stating that her powers will not allow her to go any farther. At the end of the final episode, Tiaramisu reveals herself to truly be a demon that was trapped within the Wishstone, and that her true name is Terrormisu. Now free, she plans to devour the souls of the world, but is defeated by Wario and Goodstyle. After the battle, Wario demands that she grant his wish, but she angrily flees back to her dimension, now no longer a threat to the world. In Special Episode 5, Tiaramisu appears again, issuing a challenge for Wario and Count Cannoli to find her missing items, offering to give the one who does the most precious gem of her dimension. However, when Wario is triumphant, she reveals that she considers herself to be the most precious jewel of her dimension, and, smitten with the Purple Wind, offers to join forces with him to conquer the world as King and Queen. Wario takes off running as the episode ends, with Terrormisu in pursuit. 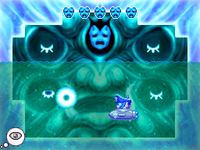 Wario starts in an entirely blue room with a sad mask up at the top, a beast-like face in the middle, and four closed eyes around the corners. To attack, the eyes will open and start shooting slow, homing balls of energy at Wario. Eventually, the eyes will all reveal blue balls of energy at once, and one of them will be red instead of blue. Wario must turn into Genius Wario to locate the red one and punch it before it disappears. This will cause the mask to start crying and fill up the stage with water. Wario must repeat the process two more times to completely fill up the stage. Wario must then transform into Captain Wario and shoot the face five times. This will destroy the mask and force Terrormisu to move to her next form. This battle has a room with fifteen holes. 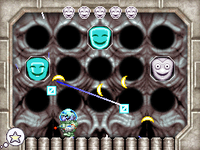 To attack, three faces will show up in three of the holes and shoot banana-shaped energy projectiles at Wario. He must transform into Cosmic Wario and shoot the faces, which will cause them to glow. If he gets all three to glow at the same time before they disappear, Terrormisu will take damage and the holes they were in will explode, meaning that the faces cannot pop out of them again. After this, spikes will pop out of the battlefield for a short time and Wario must retreat to either corner of the arena. Complete this process five times allows Terrormisu to move on to her final form. 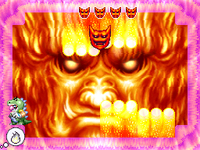 In this form, the room has a completely fiery background, with a giant mask in the middle and a smaller, real version above it. It will attack by shooting out meteors from its head. Wario must turn into Dragon Wario and stand on the lifted platforms on the edges of the room. then he must jump towards the small mask and shoot flames at it. This will cause the mask to take damage, but it will start smiling and tons of fireballs start rising up and falling down the screen. This attack is only possible to avoid by standing on the very edge of the room. Repeat this process four more times and Terrormisu will be defeated. However, it is only possible to damage the face when it is not smiling. In her human form, she's a woman with blond hair who wears a mask over her eyes. Her dress vaguely resembles a red version of Princess Peach's dress. In her demon form, she looks even more like Peach, except with a fake face covering the form's true face. She also appears slightly more heavyset than most female Mario or Wario characters. Strangely, Tiaramisu looked different long ago. She resembled a demonic imp, having dark skin, horns, bat-like wings, and a tail. She also used to wear a white mask that held a happy expression. The only thing that has remained consistent about her appearance is her effeminate blond hair. When she is fought by Wario, she takes the forms of evil masks. She first transforms into a blue, sad mask on a wall. The wall has a monster's face on it, and four blue eyes. Next, she transforms into a monster with many gray, happy faces. In Tiaramisu's final form, she is a demonic, angry face on a wall. Like the first form, the wall has a monster's face. Wario: Master of Disguise - Tiaramisu's theme music. Wario: Master of Disguise - Terrormisu's battle theme music. This is the evil demon of legend that was sealed inside the Wishstone. Hubba hubba. This page was last edited on February 17, 2019, at 22:54.